Mr Fox has been complaining about cold hands all winter last year, and who am I to not take mercy? I thought long and hard about what kind of mittens to make for him, since he tends to be rather picky and doesn’t necessarily go for colour combinations I would choose. I toyed with the idea of making just plain old solid-coloured mittens, as they tend to be quick and easy, and wouldn’t make me grumble if he lost them, but then my knitting pride took over and I wanted them to be at least a little bit fancy. The instructions will make a pair of adult men’s size mittens. I will include alterations for a women’s sized pair at the end of the pattern as well. Check out my Ravelry project page! I settled on a knitted honeycomb mitten pattern and Rowan Yarns Creative Focus Worsted, a mix of 75% Wool and 25% Alpaca in shades Natural and New Fern. I already had single balls of each colour in my stash and thought they looked rather nice together. 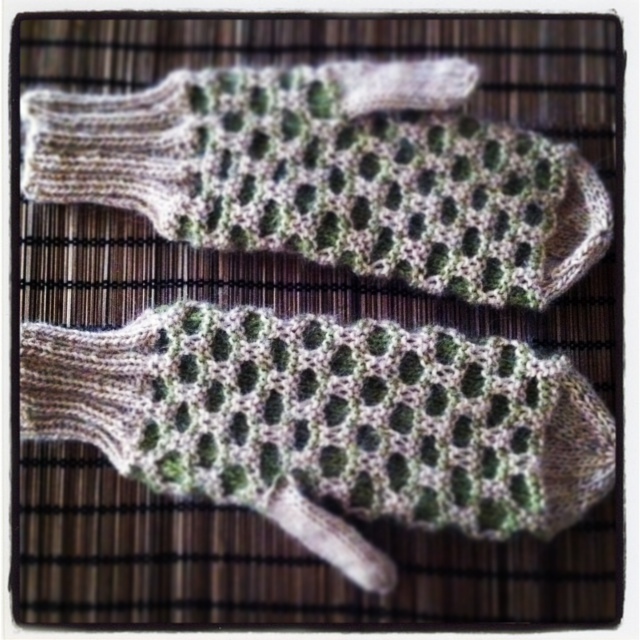 The mittens are lovely and soft, and the pattern makes them wonderfully thick and squishy. Wearing these, Mr Fox’s paws will be toasty all winter! And after knitting a pair I had enough yarn left over to make another pair for myself. 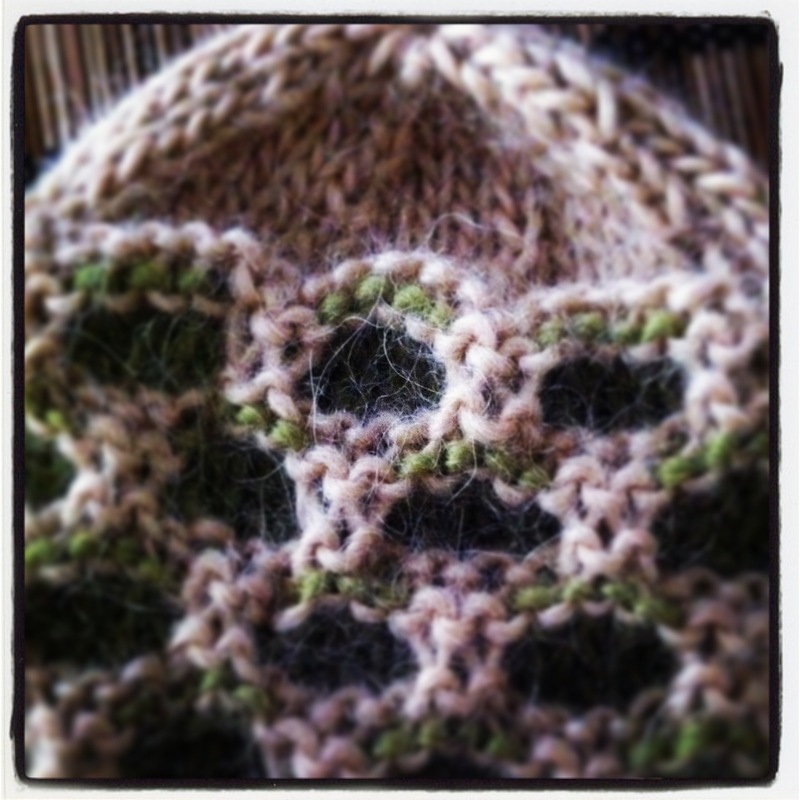 Cast on 40 sts with colour A on 3,5mm needles, distribute evenly across needles and join. Place stitch marker (optional). *K2, P2, rep from * until end. Repeat this row 24 more times for a total of 25 rows (or adjust to whichever length you prefer). Change to 4mm needles. *Inc, P4, rep from * until end (48sts). Row 1: *K4 with colour B, Sl 2 purlwise of colour A, rep from * to end of row. Repeat this row 4 more times for a total of 5 rows. Tip: Make sure colour A is at the back when starting each row. For neat colour changes, carry up colour A in the back (Great tutorial here). Row 8: *K1 with colour B, Sl 2 purlwise of colour A, K3 with colour B. Rep from * to end of row. 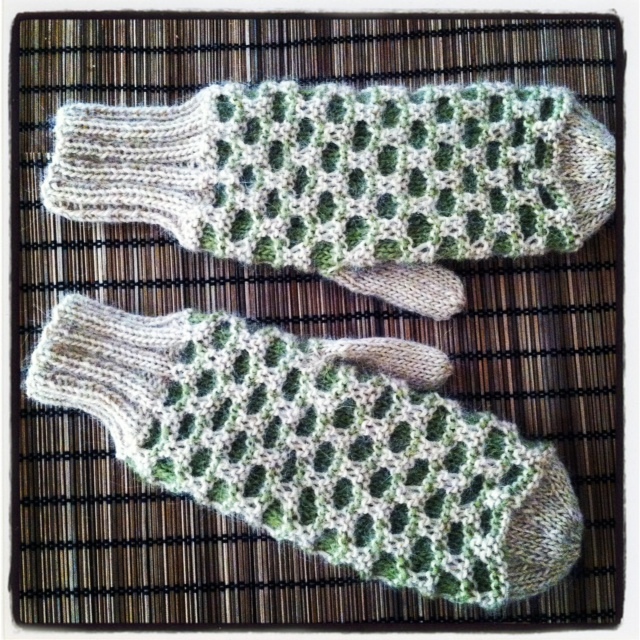 For a man’s pair of mittens, repeat pattern 2,5 times (5 rows of honeycombs, or 3 reps of Part 1, only 2 reps of Part 2). When you are about to purl the last two rows, insert thumb as follows: P2, put 7 sts on stitch holder. Cast on 7 stitches, purl to end of row. Purl one row. *When you have finished your mitten, knit thumb with colour A by picking up the 7 stitches from holder plus additional stitches for a total of 14 sts. Knit all rows until thumb is long enough. Finish by K2tog around. Knit the pattern 6,5 times (13 rows of honeycombs, or 7 reps of Part 1, 6 reps of Part 2), or adjust until the mittens are long enough. Thread yarn through remaining stitches and pull tight, weave in ends. Tah dah! If you’re knitting for an average woman’s sized hands, insert the thumb after 2 pattern repeats (4 rows of honeycombs), or after 1,5 pattern repeats (3 rows of honeycombs) for small hands. I find 48sts a good width for both men’s and women’s mittens, but you can adjust this if you’d like them wider or more snug. The pattern is worked over multiples of 6 sts, so simply add or deduct multiples of 6 sts from the total of stitches to make them wider or smaller. For my hands a total of 5,5 reps of the pattern is long enough (11 rows of honeycombs), simply adjust by adding more or less pattern repeats. Very beautiful mittens! Thanks for sharing. Hi Candi, have you tried opening the post in a separate window? https://iamsnowfox.wordpress.com/2013/10/04/manly-honeycomb-mittens/ , open the page and then simply click print all in your browser options should do the job. Let me know if that helps! Hi. Thanks for trying. I just wrote it out. and will check back to your site if I need the pics.